Wall Beds are designed to fold up and store inside a wall. Designing and installing a wall bed works well to convert small spaces into functional sleeping areas that can be put away easily. The Custom Closet can help design and install the perfect wall-bed solution for your home. Are you interested in designing a wall-bed solution to convert a small space into a bedroom? Do you require extra sleep space for the occasional house guests? Do you need a space for your grand kids to sleep when the spend the weekend? 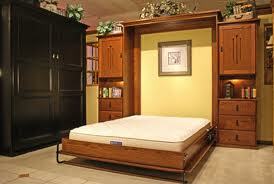 The Custom Closet Company will design a solution to solve all of your wall bed needs. The Custom Closet Company works to satisfy our customers needs, even the unique and challenging ones. Our team works closely with our customers to design and install the solution of their dreams. Are you ready to get organized? Call us at The Custom Closet Company for an appointment today! The Custom Closet Company is ready to come out and give you an in-home estimate. Call today (253) 245-3883. We service the Greater Puget Sound, including Seattle, Bellevue, Tacoma, Olympia and more. Give us a call to find out when we will be available in your area.